The major virulence factor of Cryptococcus neoformans is its capsular polysaccharide, which is also released into tissues. The shed polysaccharide is composed of glucuronoxylomannan, galactoxylomannan (GalXM), and mannoproteins. In a previous study, we demonstrated a direct interaction of purified soluble GalXM with T cells that induced their apoptosis. In this study, we focus on the mechanisms involved in the apoptotic effect of GalXM. In our experimental system, we analyzed the effect of GalXM on purified human T cells and Jurkat cells, a T cell line routinely used for apoptotic studies. Our results reveal that GalXM activates the extrinsic and intrinsic apoptotic pathways through the cleavage and recruitment of caspase-8. 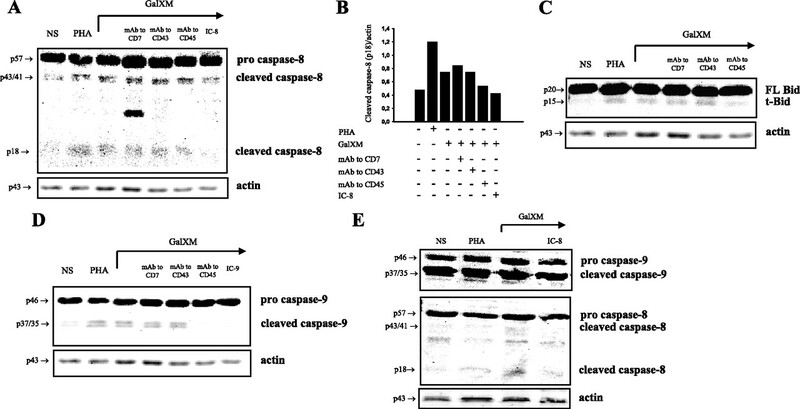 Caspase-8 elicits the downstream executioner caspase-3, caspase-6, and caspase-7 both directly and indirectly, via Bid cleavage and caspase-9 activation. These effects appeared to be primarily mediated by the interaction of GalXM with the glycoreceptors, which differed in human T and Jurkat cells. CD45 was primarily involved in Jurkat cells apoptosis while CD7 and CD43 mediated human T cell apoptosis. Our results highlight a new mechanism by which a microbial product can contribute to virulence through direct interaction with T cell glycoreceptors, thereby triggering lymphocyte apoptosis. Cryptococcus neoformans is an ubiquitous encapsulated yeast with world-wide distribution that can cause disease predominantly in immunocompromised hosts (1). Individuals most susceptible to cryptococcosis are those with T cell deficiencies (2). The major virulence factors of C. neoformans are its capsule and melanin production, as well as protease, phospholipase, and urease activities (3, 4, 5). The capsular polysaccharide is its major virulence factor that is shed into host tissues and it surrounds and protects the yeast cell. The shed polysaccharide consists of 88% glucuronoxylomannan (GXM),4 10% galactoxylomannan (GalXM), and 2% mannoprotein (4, 6, 7). Both GXM and GalXM are powerful immunomodulators but differ in their mechanism of action. GXM accumulates inside cells, where it stimulates up-regulation of Fas ligand (FasL) expression on the cell surface. FasL then interacts with the death receptor Fas expressed on activated T cells, and induces their apoptosis (8, 9). GalXM has an α-(1–6) galactan backbone containing four potential short oligosaccharide branch structures (10). It is a minor component of C. neoformans capsular material by weight, but when the respective masses of GXM and GalXM are taken into account, GalXM is found in greater molar quantities than GXM (11). Recently, it has been shown that GalXM is an exopolysaccharide that may be vesicle-associated (12). Despite its abundance in the shed polysaccharide, there is little information on its immunoregulatory properties. GalXM has been shown to induce TNF-α from PBMC (13). Moreover, GalXM induced different cytokine profiles in RAW 264.7 macrophages (14). Previously, we demonstrated that GalXM affected selected immune responses: its effects included causing significant impairment of T cell proliferation, increasing IFN-γ and IL-10 production, up regulating Fas and FasL, and inducing apoptosis of T lymphocytes through activation of caspase-8 that terminates with fragmentation of DNA (15). Apoptosis in the immune system is a fundamental process regulating lymphocyte maturation, receptor repertoire selection, and homeostasis. Death by apoptosis is essential for the growth and differentiation of lymphocytes (16). The dysregulation of apoptosis leads to a variety of immune disorders, including both immunodeficiency and autoimmunity (17). Apoptosis is induced by a range of stimuli that activate two major cell death signaling pathways. Of these, the intrinsic pathway is activated by a variety of apoptotic stimuli such as genomic toxicity and cytokine withdrawal, and it is mainly controlled by Bcl-2 protein family members (18, 19). Conversely, the extrinsic pathway is activated by death receptors of the TNF receptor superfamily that, through the activation of caspase-8, lead to downstream caspase cascade (20, 21). Specific cell surface glycoreceptors such as CD7, CD43, and CD45 (22) are expressed on T cells, and normally participate in the induction of apoptosis through interaction with galectins (23). Galectins are a family of carbohydrate-binding proteins found in various organisms including mammals and fungi with both a pro- or anti-apoptotic functions (23, 24). In this study, we investigated whether these glycoreceptors were involved in GalXM-mediated apoptosis of Jurkat and T cells. RPMI 1640 with l-glutamine and FCS were obtained from Life Technologies. Penicillin-streptomycin solution was obtained from Sigma-Aldrich. RPE-conjugated mouse mAbs to human CD45 and CD43 (both IgG1 isotype) were obtained from ImmunoTools. RPE-conjugated mouse mAb to human CD178 (FasL; IgG1 isotype) was purchased from Ancell. FITC-conjugated mouse mAb to human CD95 (Fas; IgG1 isotype) was purchased from Immunological Sciences. Rabbit polyclonal Abs to human BID, caspase-3, caspase-6, caspase-7, caspase-9, and mouse polyclonal Ab to human caspase-8 were purchased from Cell Signaling Technology. Rabbit polyclonal Ab to human FasL was purchased from Calbiochem. Rabbit polyclonal Ab to human actin was purchased from Santa Cruz Biotechnology. Inhibitors of caspase-3 (Z-DEVD-FMK), caspase-8 (Z-IETD-FMK), and caspase-9 (Z-LEHD-FMK) were obtained from Vinci-Biochem. Mouse mAbs to human CD7 (IgG3 isotype) and CD43 (IgG1 isotype) were obtained from Chemicon; mouse mAb to human CD45 (IgG1 isotype) and FITC-labeled mAbs to human CD7, CD43, and CD45 (all IgG1 isotype) were purchased from ImmunoTools. Mouse mAb to human Fas was obtained from Vinci-Biochem (IgG1 isotype). Isotype controls were obtained from Sigma-Aldrich. PHA and mouse mAb to human CD3 were obtained from Sigma-Aldrich. All reagents and medium were negative for endotoxin, as assessed by Limulus amebocyte lysate assay (QCL-1000, BioWhittaker). C. neoformans capsular polysaccharide GalXM was purified as described elsewhere (25). To eliminate LPS contamination in the GalXM preparation, this polysaccharide was dialyzed extensively vs LPS-free water and the dialysate changed until negative by Limulus amebocyte assay. The human Jurkat T cell line was obtained from the American Type Culture Collection. Cells were maintained in RPMI 1640 with l-glutamine plus 10% FCS (complete medium) and antibiotics (100 U/ml penicillin and 100 μg/ml streptomycin) at 37°C and 5% CO2. Heparinized venous blood was obtained from healthy donors. PBMC were separated by density gradient centrifugation on Ficoll-Hypaque (Pharmacia). For CD3+ T lymphocytes purification, PBMC were plated on culture flasks for 1 h in RPMI 1640 plus 5% FCS at 37°C and 5% CO2. After incubation, the nonadherent fraction was reacted with anti-human CD3 mAbs-conjugated MicroBeads (Miltenyi Biotec) and CD3+ T lymphocytes were purified by magnetic separation according to the manufacturer’s instructions. Jurkat cells and purified CD3+ T lymphocytes (both 1 × 106/ml), activated with mAb to human CD3 (1 μg/ml), were incubated for 30 min in complete medium at 4°C in the presence or absence of mAbs to human CD7, CD43 (both 0.5 μg/ml), or CD45 (1 μg/ml). After incubation, cells were washed with RPMI 1640, resuspended in complete medium, and stimulated for 18 h at 37°C and 5% CO2 in the presence or absence of PHA or GalXM (both 10 μg/ml). After stimulation, cells were centrifuged, resuspended in hypotonic propidium iodide (PI) solution (50 μg/ml) (Sigma-Aldrich), and kept for 1 h at room temperature (RT). The percentage of Jurkat cells and CD3+ T lymphocytes undergoing apoptosis was evaluated by flow cytometry analysis as previously described (26). Results shown are from one representative experiment of ten with similar results. In selected experiments Jurkat cells (1 × 106/ml) were pretreated for 30 min in complete medium on ice in the presence or absence of mAb to human CD45 (1 μg/ml). After incubation, cells were washed with RPMI 1640, resuspended in complete medium and stimulated for 18 h at 37°C and 5% CO2 in the presence or absence of PHA or GalXM (both 10 μg/ml). After stimulation, cells (2 × 105/200 μl) were collected by cytospin (700 g for 7 min) and stained by Hemacolor. In selected experiments, Jurkat cells and purified CD3+ T lymphocytes (both 1 × 106/ml), activated with mAb to human CD3 (1 μg/ml), were pretreated for 30 min in complete medium at 4°C in the presence or absence of mAbs to human CD45 (1 μg/ml) or CD43 (0.5 μg/ml), respectively. After incubation, cells were washed with RPMI 1640, resuspended in complete medium, and stimulated for 18 h at 37°C and 5% CO2 in the presence or absence of mAb to human Fas (1 μg/ml). After stimulation, cells were centrifuged, resuspended in hypotonic PI solution (50 μg/ml) (Sigma-Aldrich), and kept for 1 h at RT. The percentage of Jurkat cells and CD3+ T lymphocytes undergoing apoptosis was evaluated by flow cytometry analysis as previously described. The specificity of mAbs to human CD7, CD43, and CD45 was testified by the inefficacy of isotype controls. Jurkat cells and purified CD3+ T lymphocytes, activated with mAb to human CD3 (1 μg/ml), both at cell density of 1 × 106/ml, were incubated with GalXM (10 μg/ml) for 30 min in complete medium at 37°C and 5% CO2. After incubation, cells were washed twice, fixed with 4% formalin for 5 min at RT, washed, and reacted with RPE-labeled mAbs to human CD45 or CD43, respectively (2 μl/tube), for 40 min on ice. After incubation, the cells were washed twice with fluorescence buffer (FB), resuspended in 0.5 ml of FB, and analyzed by flow cytometry using a FACScan flow cytofluorometer (BD Biosciences). Results shown are from one representative experiment of five independent experiments with similar results. Jurkat cells and purified CD3+ T lymphocytes, activated with mAb to human CD3 (1 μg/ml), both 1 × 106/ml, were pretreated for 30 min in complete medium at 4°C in the presence or absence of mAbs to human CD7, CD43 (both 0.5 μg/ml), or CD45 (1 μg/ml). After incubation, cells were washed with RPMI 1640, resuspended in complete medium, and stimulated for 18 h at 37°C and 5% CO2 in the presence or absence of PHA or GalXM (both 10 μg/ml). After stimulation, cells were washed twice and incubated with 4% formalin for 5 min at RT. After incubation, cells were washed and reacted with FITC-labeled mAb to human CD95 (Fas) (10 μl/tube) for 40 min on ice, washed twice with FB, and reacted with RPE-labeled mAb to human CD178 (FasL) (20 μl/tube) for 40 min on ice. After incubation, cells were washed twice with FB, resuspended in 0.5 ml of FB, and analyzed by flow cytometry using a FACScan flow cytofluorometer (BD Biosciences). Data are expressed as fold increase of percentage of positive cells. The specificity of mAbs to human CD7, CD43, and CD45 was testified by the inefficacy of isotype controls. In selected experiments, for evaluation of CD7, CD43 and CD45 expression, CD3+ T lymphocytes or Jurkat cells (both 1 × 106) were fixed with 4% formalin for 5 min at RT, washed, and reacted with FITC-labeled mAbs to human CD7, CD43, or CD45 (all 1 μg/ml) for 40 min on ice. After incubation, cells were washed twice with FB, resuspended in 0.5 ml of FB, and analyzed by flow cytofluorometer (BD Biosciences). Results shown are from one representative experiment of five independent experiments with similar results. Control staining of cells with irrelevant Abs were used to obtain background fluorescence values. Jurkat cells (5 × 106/ml) were pretreated for 30 min in complete medium at 4°C in the presence or absence of mAbs to human CD7, CD43 (both 0.5 μg/ml), or CD45 (1 μg/ml). After incubation, cells were washed with RPMI 1640, resuspended in complete medium, and stimulated for 18 h at 37°C and 5% CO2 in the presence or absence of PHA or GalXM (both 10 μg/ml), and inhibitors of: caspase-8, caspase-9, and caspase-3 (all dilution 1/1000). The specificity of mAbs to human CD7, CD43, and CD45 was testified by the inefficacy of isotype controls. After incubation, the cells were washed and lysated with mammalian protein extraction reagent in the presence of protease inhibitor (Pierce). Protein concentrations were determined with a BCA protein Assay Reagent kit (Pierce). The lysates (30 μg of each sample) were separated by sodium dodecyl-sulfate-10% PAGE, transferred to a nitrocellulose membrane (Pierce) for 1 h at 100 V in a blotting system (Bio-Rad) for Western blot analysis, and the membranes were incubated overnight with rabbit polyclonal Abs to human FasL (1 μg/ml) (Calbiochem), BID, caspase-3, caspase-6, caspase-7, caspase-9, and mouse polyclonal Ab to human caspase-8 (all dilution 1/1000; all from Cell Signaling Technology) in blocking buffer. Detection was achieved with the appropriate secondary Abs coupled to HRP, followed by ChemiLucent Trial Kit (Chemicon). Immunoblotting with rabbit polyclonal Ab to actin (dilution 1/200; Santa Cruz Biotechnology) was used as internal loading control to ensure equivalent amounts of protein in each lane. Immunoreactive bands were visualized and quantified by Chemidoc instrument (Bio-Rad). Unless otherwise specified, data are reported as the mean ± SEM from three to five separate experiments and Student’s t test was used to determine the statistical significance of differences between experimental groups. A value of p < 0.05 was considered significant. In a previous study, we showed that purified soluble GalXM induced T lymphocyte apoptosis through activation of caspase-8 (15). In the present study, we focused on the mechanisms involved in the apoptosis induced by GalXM. To this end, in our experimental system, we used Jurkat cells, a human T cell line routinely used for apoptotic studies. First, we analyzed whether selected T cell receptors such as CD7, CD43, and CD45 could be involved in the GalXM-mediated apoptotic effect, because they normally participate in apoptosis induced by galectins. These comprise a family of carbohydrate-binding proteins endowed with pro- or anti-apoptotic functions that can found in various organisms including mammals and fungi (22, 23, 24). To investigate this hypothesis, we performed blocking-type experiments where Jurkat cells were first pretreated with mAbs to CD7, CD43, or CD45 (27) and then stimulated for 18 h with GalXM. A significant increase in the percentage of apoptotic cells after stimulation with GalXM or positive control PHA was observed (9). The pretreatment of cells with mAb to CD45 significantly reduced apoptosis, whereas blocking CD7 and CD43 with specific mAbs produced no significant effect (Fig. 1⇓A). Given that surface molecules such as Fas and FasL are involved in the induction of apoptosis and that their reciprocal interaction inevitably leads to programmed cell death (28), we analyzed Fas and FasL expression on Jurkat cells, which constitutively express Fas (29, 30). GalXM treatment resulted in a significant increase in the percentage of Fas positive cells (Fig. 1⇓B). 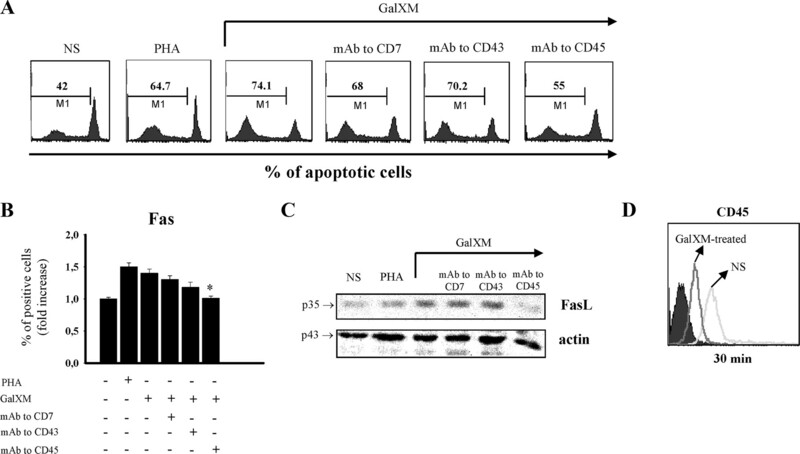 The proapoptotic effect of GalXM was lost when cells were pretreated with mAb to CD45 (Fig. 1⇓B). These results were confirmed by showing that the FasL protein level in Jurkat cells resulted significantly increased after GalXM stimulation. This effect was modest in cells pretreated with mAb to CD45, while it was evident after treatment with mAbs to CD7 and CD43 (Fig. 1⇓C). To analyze whether GalXM interfered with binding of mAb to CD45 we determined whether CD45 expression was altered in GalXM-treated cells. The result was a significant down-regulation of CD45 expression in Jurkat cells, relative to untreated cells (Fig. 1⇓D). Evaluation of apoptosis, Fas, FasL, and CD45 expression in Jurkat cells treated with GalXM. Jurkat cells (1 × 106/ml) were incubated in the presence or absence (NS) of mAbs to CD7, CD43 (both 0.5 μg/ml), or CD45 (1 μg/ml) for 30 min at 4°C and then cultured for 18 h at 37°C and 5% CO2 in the presence or absence of PHA or GalXM (both 10 μg/ml). The percentage of Jurkat cells undergoing apoptosis was evaluated by PI staining and analyzed using a FACScan flow cytofluorometer (A). Data are expressed as percentage of apoptotic cells of one representative experiment of ten experiments with similar results. For evaluation of Fas expression, Jurkat cells (1 × 106), treated as above described, were reacted with FITC-labeled mAb to CD95 (Fas) and analyzed by flow cytometry (B). Data are expressed as the fold increase of the percentage of positive cells. For evaluation of FasL protein level, Jurkat cells (5 × 106/ml), treated as above described, were lysated and subjected to Western blot. Membranes were incubated with Ab to FasL (C). The specificity of mAbs to CD7, CD43, and CD45 was testified by the inefficacy of isotype controls. ∗, p < 0.05 mAb to CD45 plus GalXM-treated cells vs GalXM-treated cells. Jurkat cells (1 × 106/ml) were incubated in the presence or absence (NS) of GalXM (10 μg/ml) for 30 min at 37°C and 5% CO2. After incubation, cells were reacted with RPE-labeled mAb to CD45 and analyzed by flow cytometry. FACScan histogram of mean of fluorescence intensity (MFI) of CD45 expression of one representative experiment of five with similar results was reported (D). Controls staining of cells with irrelevant Abs were used to obtain background fluorescence values. Apoptosis through the activation of the extrinsic pathway is known to involve Fas interaction with activation of caspase-8, which in turn causes cell death through DNA fragmentation by the activation of the effector caspase-3, caspase-6, and caspase-7. In contrast, the intrinsic pathway is induced by cellular stress with consequent activation of mitochondria leading to the release of proapoptotic molecule cytochrome c, which together with Apaf-1 and procaspase-9 forms the apoptosome. The formation of the apoptosome leads to the activation of caspase-9, followed by the activation of downstream effector caspases. Notably, active caspase-8 can cleave Bid (31), a Bcl-2 family member, with generation of a small fragment called truncated Bid (tBid); tBid translocates to the mitochondrial outer membrane and inhibits the function of the anti-apoptotic proteins Bcl-2 and Bcl-xL, leading to the activation of the intrinsic death pathway (20, 21, 32, 33). Addition of GalXM to Jurkat cells resulted in the activation of caspase-8 after 18 h (Fig. 2⇓A). The pretreatment of cells with mAb to CD45 reduced this activation, but no effect was observed with mAbs to CD7 and CD43 (Fig. 2⇓A). Furthermore, in GalXM-treated cells, caspase-8 led to tBid production (Fig. 2⇓C). There is compelling evidence that tBid acts as a support between the extrinsic and intrinsic pathways (20). Consequently, we analyzed the activation of caspase-9, a crucial caspase in the intrinsic pathway, after Jurkat cells were treated with GalXM for 18 h. GalXM induced activation of caspase-9 and, interestingly, pretreatment of cells with mAb to CD45, but not with CD7 and CD43, reduced this activation (Fig. 2⇓D). Caspase-8, Bid, and caspase-9 activations induced by GalXM in Jurkat cells. Jurkat cells (5 × 106/ml) were incubated in the presence or absence (NS) of mAbs to CD7, CD43 (both 0.5 μg/ml), or CD45 (1 μg/ml) for 30 min at 4°C and then cultured for 18 h at 37°C and 5% CO2 in the presence or absence of caspase-8 or caspase-9 inhibitors (IC-8 or IC-9; both dilution 1/1000), PHA, or GalXM (both 10 μg/ml). Cells were lysated and protein lysates were studied by immunoblot. Membranes were incubated with Abs to caspase-8 (A and E, lower panel), Bid (C) and caspase-9 (D and E, upper panel). OD of reactive bands was measured and normalized by the actin intensity in the same lane (A and B). The specificity of mAbs to CD7, CD43, and CD45 was controlled by demonstrating the inefficacy of isotype matched irrelevant controls. Results shown are from one representative experiment of five with similar results. To verify whether the activation of caspase-9 reflected the direct activation of the intrinsic pathway, Jurkat cells were stimulated with GalXM for 18 h in the presence or absence of caspase-8 inhibitor. Treatment of cells with caspase-8 inhibitor sensibly reduced the activation of caspase-9 induced by GalXM (Fig. 2⇑E, upper panel). The specificity of this effect was confirmed by the GalXM-induced inhibition of caspase-8 activation through caspase-8 inhibitor (Fig. 2⇑E, lower panel). We interpret these findings as suggestive that GalXM-induced caspase-9 activation is at least in part due to the activation of caspase-8. Next, we analyzed the activation of effector caspases such as caspase-3, caspase-6, and caspase-7. GalXM induced activation of caspase-3 (Fig. 3⇓, A and B), and notably, mAb to CD45 strongly reduced this activation. In contrast, neither mAbs to CD7 or CD43 influenced GalXM-mediated caspase-3 activation. GalXM also induced the activation of caspase-6 (Fig. 3⇓, C and D) and caspase-7 (Fig. 3⇓, E and F). The action of these caspases was significantly blocked in cells pretreated with mAb to CD45. In the light of these results, we argue that CD45 seems to be directly involved in the apoptosis of Jurkat cells induced by GalXM. GalXM-treated cells exhibited apoptotic cellular changes consisting of an altered morphology characterized by surface blebs and nuclear fragmentation. These changes were prevented by treating cells with mAb to CD45 before incubation with GalXM (Fig. 4⇓). 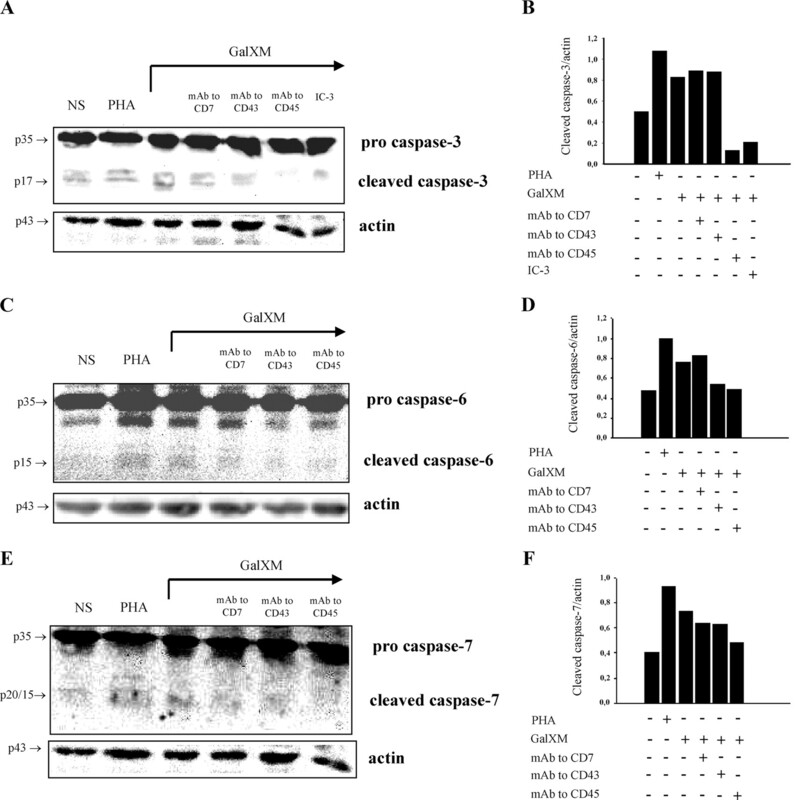 Caspase-3, caspase-6, and caspase-7 activations induced by GalXM in Jurkat cells. Jurkat cells (5 × 106/ml) were incubated in the presence or absence (NS) of mAbs to CD7, CD43 (both 0.5 μg/ml), or CD45 (1 μg/ml) for 30 min at 4°C and then cultured for 18 h at 37°C and 5% CO2 in the presence or absence of caspase-3 inhibitor (IC-3; dilution 1/1000), PHA, or GalXM (both 10 μg/ml). Cells were lysated and protein lysates were studied by immunoblot. Membranes were incubated with Abs to caspase-3 (A), caspase-6 (C), and caspase-7 (E). OD of reactive bands was measured and normalized by the actin intensity in the same lane (B, D, and F). The specificity of mAbs to CD7, CD43, and CD45 was controlled by demonstrating the inefficacy of isotype-matched irrelevant controls. Results shown are from one representative experiment of five with similar results. Nuclear fragmentation induced by GalXM in Jurkat cells. Jurkat cells (1 × 106/ml) were incubated in the presence or absence (NS) of mAb to CD45 (1 μg/ml) for 30 min at 4°C and then cultured for 18 h at 37°C and 5% CO2 in the presence or absence of PHA or GalXM (both 10 μg/ml). After incubation, cells were collected by cytospin and stained with H&E. GalXM-treated cells exhibited altered morphology, surface blebs, and nuclear fragmentation (arrows). N = cell nucleus; original magnification, ×40. Finally, we studied the apoptotic effect of GalXM on purified CD3+ T lymphocytes. For this purpose, purified CD3+ T lymphocytes were stimulated with mAb to CD3 in culture tubes. Activated CD3+ T lymphocytes were pretreated for 30 min on ice with mAbs to CD7, CD43, or CD45 and then stimulated for 18 h with GalXM. We observed a significant increase in the percentage of apoptotic cells after stimulation with GalXM. Once incubated with T lymphocytes, mAbs to CD7 and CD43, but not to CD45, reduced the percentage of apoptotic T cells (Fig. 5⇓A). Fas and FasL expression on CD3+ T lymphocytes was also tested, and the involvement of GalXM in the up-regulation of these surface molecules was observed. It resulted that blocking CD43 led to a significant reduction of both Fas and FasL expression, while blocking CD7 only affected the expression of FasL (Fig. 5⇓B). Evaluation of apoptosis, Fas, FasL, and CD43 expression in T cells GalXM-treated (A, B, and D). Analysis of CD7, CD43, and CD45 expression in T and Jurkat cells (C). Purified CD3+ T lymphocytes (1 × 106/ml), activated with mAb to CD3 (1 μg/ml), were incubated in the presence or absence (NS) of mAbs to CD7, CD43 (both 0.5 μg/ml), or CD45 (1 μg/ml) for 30 min at 4°C and then cultured for 18 h at 37°C and 5% CO2 in the presence or absence of PHA or GalXM (both 10 μg/ml). The percentage of CD3+ T lymphocytes undergoing apoptosis was evaluated by PI staining and analyzed using a FACScan flow cytofluorometer (A). Data are expressed as percentage of apoptotic cells of one representative experiment of ten with similar results. For evaluation of Fas and FasL expression, purified CD3+ T lymphocytes (1 × 106), treated as above described, were reacted with FITC-labeled mAb to CD95 (Fas) and RPE-labeled mAb to CD178 (FasL) and analyzed by flow cytometry (B). Data are expressed as fold increase of percentage of positive cells. The specificity of mAbs to CD7, CD43, and CD45 was controlled by demonstrating the inefficacy of isotype-matched irrelevant controls. For the analysis of glycoreceptors expression, purified CD3+ T lymphocytes and Jurkat cells (both 1 × 106) were reacted with FITC-labeled mAbs to CD7, CD43, and CD45 and analyzed by FACScan flow cytofluorometer (C). Data are expressed as mean of fluorescence intensity (MFI) of one representative experiment of five with similar results. ∗, p < 0.05 mAbs plus GalXM-treated cells vs GalXM-treated cells. Purified CD3+ T lymphocytes (1 × 106/ml), activated with mAb to CD3 (1 μg/ml), were incubated in the presence or absence (NS) of GalXM (10 μg/ml) for 30 min. After incubation, cells were reacted with RPE-labeled mAb to CD43 and analyzed by flow cytometry. FACScan histogram of mean of fluorescence intensity (MFI) of CD43 expression of one representative experiment of five with similar results was reported (D). Incubating cells with irrelevant Abs was used as a control to obtain background fluorescence values. To understand the differences in the involvement of CD7, CD43, and CD45 in GalXM-mediated apoptosis in human T lymphocytes and Jurkat cells, we analyzed the surface expression of these glycoreceptors on the two cell types. In both cell types, the expression of CD43 and CD45 was greater than that of CD7. In particular, in our experimental system we showed a higher expression of CD43 on human T cells and of CD45 on Jurkat cells (Fig. 5⇑C). We further analyzed whether GalXM interferes with binding of mAb to CD43. The results showed a significant down-regulation of CD43 expression 30 min after GalXM treatment (Fig. 5⇑D). Given that the treatment with mAbs to CD43 or CD45 resulted in a partially blockage of GalXM-induced apoptosis, the considered possibility is that this treatment induced an anti-apoptotic effect. To sort out this possibility Jurkat or T cells were pretreated with mAbs to CD45 (1 μg/ml) or CD43 (0.5 μg/ml), respectively, then the apoptosis was induced by mAb to Fas (1 μg/ml). The results showed that mAbs to CD45 or CD43 did not alter apoptosis anti-Fas induced (data not shown). The role of T cell activation and T cell apoptosis on the acquisition of immune tolerance and development of active immune regulation is very complex. Compelling evidence shows that GXM, a major capsular component of C. neoformans, is able to induce a myriad of suppressive effects on innate and adaptative immunity that culminate in apoptosis induction. In contrast, relatively little work has been done on GalXM, possibly because it was presumed to be a minor component of the fungus’ polysaccharidic capsule. However, it is now clear that on a molar basis GalXM may be the major component of the shed polysaccharide (12). In a previous study, we showed for the first time that GalXM can affect selected immune responses, and in particular that GalXM could cause significant impairment of T cell proliferation, increase IFN-γ and IL-10 production, up-regulate Fas and FasL expression, and induce the apoptosis of T lymphocytes through activation of caspase-8 (15). In this study, we have expanded upon these observations by exploring the mechanisms involved in the GalXM-mediated apoptotic effect. The analysis was performed on Jurkat cells and purified human T cells. Our results demonstrate that GalXM: 1) induces apoptosis in Jurkat cells and purified human T lymphocytes; 2) up-regulates Fas and FasL expression; 3) activates the extrinsic and intrinsic pathways through the cleavage and recruitment of caspase-8, Bid, caspase-9, and effector caspases 3, 6, and 7. These effects seem to be mediated by the interaction between GalXM and the glycoreceptors CD7, CD43, and CD45, which are expressed on T cell surface and are normally involved in galectin-induced apoptosis. In particular, we found that CD45 activation was correlated with induction of apoptosis in Jurkat cells, while CD7 and CD43 activation was associated with apoptosis of T cells. Moreover, these differences could be at least in part due to the different expression of these glycoreceptors on T lymphocytes and Jurkat cells. In our experimental system, we showed that expression of CD43 and CD45 in both cell types was higher than expression of CD7. In particular, we found a higher expression of CD43 in human T cells, while expression of CD45 was higher in Jurkat cells. CD45 has two cytoplasmic tyrosine phosphatase domains (34). Upon ligation by multivalent ligands, CD45 is often clustered or rearranged on the cell surface, bringing the CD45 molecules into close proximity (24). It has been proposed that clustering of CD45 aims at blocking access of these domains to phosphorylated substrates (35), thereby reducing CD45 tyrosine phosphatase activity. To affect regulatory T cell functions including apoptosis, this change in phosphorylation requires abundant glycosilation of the CD45 ectodomain (36, 37). Given that GalXM produces apoptosis in Jurkat cells via CD45, it is conceivable that GalXM-mediated cross-linking could require large glycosilation of CD45. In this regard, GalXM is known to be a macromolecule with repeating carbohydrate motifs which in theory can interact with multiple receptors. The interference of GalXM with mAbs to CD45 or CD43 was demonstrated by drastic decrease of CD43 or CD45 expression on Jurkat or T cells, respectively, soon after GalXM addition. These results suggest that GalXM uptake is through these receptors which mediate proapoptotic effects of GalXM. Consistent with this scenario, we found a drastic reduction of GalXM-mediated apoptosis by blocking CD45 or CD43 with specific Abs. In contrast a specific anti-apoptotic effect of these Abs could be excluded given their inability to alter apoptosis induced by Ab to Fas. There are several cell surface Ags and factors that might regulate the sensitivity of T cells to FasL. One of the most immunologically important means of facilitating T cell death by FasL is through TCR occupancy (38). Several surface molecules including CD45 and CD99 have been implicated in the increase of Fas-mediated cell death (39, 40). In our experimental system, GalXM-induced apoptosis was primarily mediated by CD45 crosslinking, and it was associated with an up-regulation of Fas and FasL expression on Jurkat cells. This observation implies that a microbial compound can directly affect T cell function bypassing processing by APC. Apoptosis is induced by a range of stimuli that activate two major cell death signaling pathways: extrinsic or intrinsic. The extrinsic pathway of apoptosis is initiated when Fas is engaged by FasL, and this leads to the activation of caspase-8, which in turn activates the effector caspases 3, 6, and 7 to induce DNA fragmentation. The intrinsic pathway is induced by cellular stress with consequent activation of mitochondria, which subsequently release the proapoptotic molecule cytochrome c. In the cytoplasm, cytochrome c forms the apoptosome together with Apaf-1 and procaspase-9. Apoptosome formation leads to the activation of caspase-9 and its relative downstream effector caspases. Moreover, active caspase-8 can cleave the Bcl-2 family member Bid (31), with consequent generation of a small fragment called truncated Bid (tBid); tBid translocates to the mitochondrial outer membrane, where it inhibits the function of the anti-apoptotic proteins Bcl-2 and Bcl-xL, thereby leading to the activation of the intrinsic death pathway (20, 21, 32, 33). GalXM interaction with T cells induced both the extrinsic and intrinsic apoptotic pathways. Indeed, GalXM induced the activation of caspase-8, which initiates the death signal pathway directly by activating downstream caspases such as caspase-3, caspase-6, and caspase-7, and indirectly by affecting Bid. This results in cross-talk between the extrinsic and intrinsic pathways with consequent activation of caspase-9. This effect was confirmed by the inhibition of caspase-9 activation with a caspase-8 inhibitor, a finding implying that caspase-9 activation is at least partly due to the activation of caspase-8. Furthermore, the critical involvement of CD45 in Fas and FasL up-regulation, as well as in the activation of caspase-8 and subsequent apoptosis mediated by GalXM, could be crucial to elucidate how some microbial components can mediate and regulate T cell response. In addition, given that CD45 is a target of several galectins, a family of multifunctional proteins implicated in a variety of biological functions including tumor cell adhesion, proliferation, differentiation, angiogenesis, apoptosis, cancer progression, and metastasis (41), the interference of GalXM with this important protein family could provide a new tool to manipulate their biological effects. There is convincing data that galectin-1 and galectin-3 are strongly involved in the apoptosis of T lymphocytes, thymocytes, and tumor cells by cross-linking with glycoreceptors such as CD7, CD43, and CD45 (24, 41). GalXM seems to bind these cellular receptors in a way similar to galectin-1 and also produce similar effects. To our knowledge, this is the first demonstration that a fungal compound possesses immunoregulatory effects similar to those of galectins, and this suggests a new angle for studying and understanding the protean effects of cryptococcal infection on the immune system. Indeed, it appears that GalXM produces apoptosis via different cellular receptors for the tumor-derived Jurkat T cell line and human purified T cells. In this regard, we note that in tumor-derived cell lines apoptosis was mediated almost exclusively by CD45; in contrast, in human T cells apoptosis was induced via CD43 and CD7. This apparent discrepancy is likely due to different expression of CD7, CD43, and CD45 on the two cell types. Evidence in support of this hypothesis is provided by the observation that, in our experimental system, T cells expressed higher levels of CD7 than Jurkat tumor cells. Moreover, given its relevance in the engagement of glycoreceptors (24), the grade of glycosilation of ectodomains could account for these differences. However, detailed studies are necessary to unravel this issue. In conclusion, our results identify several key steps of the mechanism by which GalXM mediates T cell apoptosis and implicates glycoreceptors in this process. The observation that GalXM promotes apoptosis by interacting with glycoreceptors provides a new mechanism whereby a microbial product can subvert immune function interactions with host cell receptors, in an interaction that might possibly reflect molecular mimicry by GalXM for a host ligand. Furthermore, this insight opens new perspectives of intervention in regulating critical T cell functions in cryptococcosis. Also, it could potentially herald new approaches for modulating diseases mediated or aggravated by glycoreceptor activation. We are grateful to Francesca Selmo for editorial assistance. ↵1 This work was supported by Public Health Service Grant AI14209 from the National Institutes of Health and Investment for Basic Research, protocol No. RBLA03C9F4_006. A.C. and M.D.J. were supported by National Institutes of Health Grants R01AI033774-15, R01HL059842-12, and R37AI033142. ↵2 E.P. and E.G. contributed equally to the paper. ↵4 Abbreviations used in this paper: GXM, glucuronoxylomannan; GalXM, galactoxylomannan; FasL, Fas ligand; PI, propidium iodide; RT, room temperature; FB, fluorescence buffer; tBid, truncated Bid. Lim, T. S., J. W. Murphy. 1980. Transfer of immunity to cryptococcosis by T-enriched splenic lymphocytes from Cryptococcus neoformans-sensitized mice. Infect. Immun. 30: 5-11. Good, C. B., W. A. Coax. 1990. Cryptococcal infections in patients with AIDS. N. Engl. J. Med. 322: 701-702. Perfect, J. R., A. Casadevall. 2002. Cryptococcosis. Infect Dis. Clin. North Am. 16: 837-874, v–vi. Vecchiarelli, A.. 2000. Immunoregulation by capsular components of Cryptococcus neoformans. Med. Mycol. 38: 407-417. Monari, C., E. Pericolini, G. Bistoni, E. Cenci, F. Bistoni, A. Vecchiarelli. 2005. Influence of indinavir on virulence and growth of Cryptococcus neoformans. J. Infect. Dis. 191: 307-311. Turner, S. H., R. Cherniak, E. Reiss. 1984. Fractionation and characterization of galactoxylomannan from Cryptococcus neoformans. Carbohydr. Res. 125: 343-349. Pietrella, D., P. Lupo, F. Bistoni, A. Vecchiarelli. 2004. An early imbalance of interleukin 12 influences the adjuvant effect of mannoproteins of Cryptococcus neoformans. Cell Microbiol. 6: 883-891. Monari, C., F. Bistoni, A. Casadevall, E. Pericolini, D. Pietrella, T. R. Kozel, A. Vecchiarelli. 2005. Glucuronoxylomannan, a microbial compound, regulates expression of costimulatory molecules and production of cytokines in macrophages. J. Infect. Dis. 191: 127-137. Monari, C., E. Pericolini, G. Bistoni, A. Casadevall, T. R. Kozel, A. Vecchiarelli. 2005. Cryptococcus neoformans capsular glucuronoxylomannan induces expression of fas ligand in macrophages. J. Immunol. 174: 3461-3468. Vaishnav, V. V., B. E. Bacon, M. O'Neill, R. Cherniak. 1998. Structural characterization of the galactoxylomannan of Cryptococcus neoformans Cap67. Carbohydr. Res. 306: 315-330. McFadden, D. C., M. De Jesus, A. Casadevall. 2006. The physical properties of the capsular polysaccharides from Cryptococcus neoformans suggest features for capsule construction. J. Biol. Chem. 281: 1868-1875. De Jesus, M., A. M. Nicola, M. L. Rodrigues, G. Janbon, A. Casadevall. 2009. Capsular localization of the Cryptococcus neoformans polysaccharide component galactoxylomannan. Eukaryot Cell. 8: 96-103. Chaka, W., A. F. Verheul, V. V. Vaishnav, R. Cherniak, J. Scharringa, J. Verhoef, H. Snippe, I. M. Hoepelman. 1997. Cryptococcus neoformans and cryptococcal glucuronoxylomannan, galactoxylomannan, and mannoprotein induce different levels of tumor necrosis factor α in human peripheral blood mononuclear cells. Infect. Immun. 65: 272-278. Villena, S. N., R. O. Pinheiro, C. S. Pinheiro, M. P. Nunes, C. M. Takiya, G. A. DosReis, J. O. Previato, L. Mendonca-Previato, C. G. Freire-de-Lima. 2008. Capsular polysaccharides galactoxylomannan and glucuronoxylomannan from Cryptococcus neoformans induce macrophage apoptosis mediated by Fas ligand. Cell Microbiol. 10: 1274-1285. Pericolini, E., E. Cenci, C. Monari, M. De Jesus, F. Bistoni, A. Casadevall, A. Vecchiarelli. 2006. Cryptococcus neoformans capsular polysaccharide component galactoxylomannan induces apoptosis of human T-cells through activation of caspase-8. Cell Microbiol. 8: 267-275. Blankenberg, F. G.. 2008. In vivo detection of apoptosis. J. Nucl. Med. 49: (Suppl. 2):81S-95S. Danial, N. N.. 2007. BCL-2 family proteins: critical checkpoints of apoptotic cell death. Clin. Cancer Res. 13: 7254-7263. Puthalakath, H., A. Strasser. 2002. Keeping killers on a tight leash: transcriptional and post-translational control of the pro-apoptotic activity of BH3-only proteins. Cell Death Differ. 9: 505-512. Zhang, N., H. Hartig, I. Dzhagalov, D. Draper, Y. W. He. 2005. The role of apoptosis in the development and function of T lymphocytes. Cell Res. 15: 749-769. Krammer, P. H.. 2000. CD95’s deadly mission in the immune system. Nature 407: 789-795. Rabinovich, G. A., L. G. Baum, N. Tinari, R. Paganelli, C. Natoli, F. T. Liu, S. Iacobelli. 2002. Galectins and their ligands: amplifiers, silencers or tuners of the inflammatory response?. Trends Immunol. 23: 313-320. Liu, F. T.. 2000. Galectins: a new family of regulators of inflammation. Clin. Immunol. 97: 79-88. Hernandez, J. D., L. G. Baum. 2002. Ah, sweet mystery of death! Galectins and control of cell fate. Glycobiology 12: 127R-136R. James, P. G., R. Cherniak. 1992. Galactoxylomannans of Cryptococcus neoformans. Infect. Immun. 60: 1084-1088. Migliorati, G., I. Nicoletti, M. C. Pagliacci, L. D'Adamio, C. Riccardi. 1993. Interleukin-4 protects double-negative and CD4 single-positive thymocytes from dexamethasone-induced apoptosis. Blood 81: 1352-1358. Monari, C., T. R. Kozel, F. Paganelli, E. Pericolini, S. Perito, F. Bistoni, A. Casadevall, A. Vecchiarelli. 2006. Microbial immune suppression mediated by direct engagement of inhibitory Fc receptor. J. Immunol. 177: 6842-6851. Griffith, T. S., T. Brunner, S. M. Fletcher, D. R. Green, T. A. Ferguson. 1995. Fas ligand-induced apoptosis as a mechanism of immune privilege. Science 270: 1189-1192. Juo, P., M. S. Woo, C. J. Kuo, P. Signorelli, H. P. Biemann, Y. A. Hannun, J. Blenis. 1999. FADD is required for multiple signaling events downstream of the receptor Fas. Cell Growth Differ. 10: 797-804. Liu, J., C. A. Kuszynski, B. T. Baxter. 1999. Doxycycline induces Fas/Fas ligand-mediated apoptosis in Jurkat T lymphocytes. Biochem. Biophys. Res. Commun. 260: 562-567. Gross, A., X. M. Yin, K. Wang, M. C. Wei, J. Jockel, C. Milliman, H. Erdjument-Bromage, P. Tempst, S. J. Korsmeyer. 1999. Caspase cleaved BID targets mitochondria and is required for cytochrome c release, while BCL-XL prevents this release but not tumor necrosis factor-R1/Fas death. J. Biol. Chem. 274: 1156-1163. Singh, R., S. Pervin, G. Chaudhuri. 2002. Caspase-8-mediated BID cleavage and release of mitochondrial cytochrome c during Nomega-hydroxy-l-arginine-induced apoptosis in MDA-MB-468 cells: antagonistic effects of l-ornithine. J. Biol. Chem. 277: 37630-37636. Nguyen, J. T., D. P. Evans, M. Galvan, K. E. Pace, D. Leitenberg, T. N. Bui, L. G. Baum. 2001. CD45 modulates galectin-1-induced T cell death: regulation by expression of core 2 O-glycans. J. Immunol. 167: 5697-5707. Majeti, R., A. M. Bilwes, J. P. Noel, T. Hunter, A. Weiss. 1998. Dimerization-induced inhibition of receptor protein tyrosine phosphatase function through an inhibitory wedge. Science 279: 88-91. Desharnais, P., G. Dupere-Minier, C. Hamelin, P. Devine, J. Bernier. 2008. Involvement of CD45 in DNA fragmentation in apoptosis induced by mitochondrial perturbing agents. Apoptosis 13: 197-212. Elola, M. T., M. E. Chiesa, A. F. Alberti, J. Mordoh, N. E. Fink. 2005. Galectin-1 receptors in different cell types. J Biomed Sci. 12: 13-29. Wong, B., J. Arron, Y. Choi. 1997. T cell receptor signals enhance susceptibility to Fas-mediated apoptosis. J. Exp. Med. 186: 1939-1944. Klaus, S. J., S. P. Sidorenko, E. A. Clark. 1996. CD45 ligation induces programmed cell death in T and B lymphocytes. J. Immunol. 156: 2743-2753. Jung, K. C., N. H. Kim, W. S. Park, S. H. Park, Y. Bae. 2003. The CD99 signal enhances Fas-mediated apoptosis in the human leukemic cell line, Jurkat. FEBS Lett. 554: 478-484. Camby, I., M. Le Mercier, F. Lefranc, R. Kiss. 2006. Galectin-1: a small protein with major functions. Glycobiology 16: 137R-157R.